Wired profiles a stealthy startup tech company that garnered lots of insider interest and piles of funding. The company is called Magic Leap. It’s raked in $1.4 billion in venture funds from industry luminaries including Google, Qualcomm, Kleiner Perkins Caufield Byers, Vulcan Capital, and Andreessen Horowitz. Like several hundred other companies Magic Leap is developing a virtual reality (VR) system. But what sets Magic Leap apart from many of its competitors is its focus on mixed reality (MR). Mixed reality overlays VR onto the real world. This allows synthetic constructions of VR to be superimposed over actual visual surroundings. VR technologists agree that MR systems are much more difficult to construct than fully immersive VR, but provide much richer and compelling user experiences. Magic Leap calls their technology Cinematic Reality. That’s where the story of Magic Leap begins. There is something special happening in a generic office park in an uninspiring suburb near Fort Lauderdale, Florida. Inside, amid the low gray cubicles, clustered desks, and empty swivel chairs, an impossible 8-inch robot drone from an alien planet hovers chest-high in front of a row of potted plants. It is steampunk-cute, minutely detailed. I can walk around it and examine it from any angle. I can squat to look at its ornate underside. Bending closer, I bring my face to within inches of it to inspect its tiny pipes and protruding armatures. I can see polishing swirls where the metallic surface was “milled.” When I raise a hand, it approaches and extends a glowing appendage to touch my fingertip. I reach out and move it around. I step back across the room to view it from afar. All the while it hums and slowly rotates above a desk. It looks as real as the lamps and computer monitors around it. It’s not. I’m seeing all this through a synthetic-reality headset. Intellectually, I know this drone is an elaborate simulation, but as far as my eyes are concerned it’s really there, in that ordinary office. It is a virtual object, but there is no evidence of pixels or digital artifacts in its three-dimensional fullness. If I reposition my head just so, I can get the virtual drone to line up in front of a bright office lamp and perceive that it is faintly transparent, but that hint does not impede the strong sense of it being present. This, of course, is one of the great promises of artificial reality—either you get teleported to magical places or magical things get teleported to you. And in this prototype headset, created by the much speculated about, ultrasecretive company called Magic Leap, this alien drone certainly does seem to be transported to this office in Florida—and its reality is stronger than I thought possible. Image: Magic Leap MR screenshot. 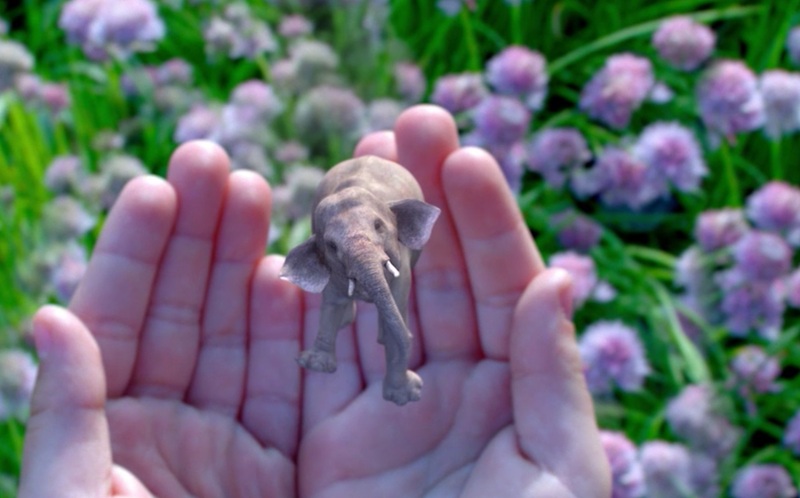 The hands live in the real world, the miniature elephant lives in a digitized VR world.